I have been wanting to write a blog which talks about my approach to portrait photography for some time now. I don’t class myself as a dedicated portrait photographer, it is a discipline within my photography that accompanies my writing and story-telling, ultimately creating a more sincere and complete piece of work. nevertheless it does form a large part of my work, if you have ever read any of my interviews, you will find accompanying the so called action shots, are relevant portrait photographs. With this in mind, I want to share with you some of the key methods and ideas that I employ when approaching my portrait work. I have learned a great deal over the years, mostly from analysing what I feel has not worked during previous projects as well as listening to feed back from publishers and subjects alike. This is not a step by step guide and the order in which I have written these points is not necessarily the order of my workflow. My aim is to offer a window into some of the thoughts and processes that I typically run through when capturing portrait shots. It is in my opinion, that the relationship between between the photographer and subject is the one that is the most neglected. It is the quality of this liaison that will ultimately dictate how the observer will feel about a piece of work you are putting out into the public domain. Will it be perceived as sincere? Are you genuinely interested in your subjects story? Or are you simply wanting to create a false narrative purely for Instagram content; nothing more than to massage your own ego. You have to take time to understand your subject. Try to spend a moment imagining what it might be like to walk a mile in their shoes. Listen to what they have to say and take a legitimate interest in what they are saying. Do not adorn them with platitudes so you can simply get them in front of the camera, remember, a photo should invoke a feeling and failing on any of the points above will yield a defensive response from your subject - whether or not they are consciously aware of it at the time. Taking the time to build a genuine and honest relationship will build trust, and with trust comes honesty. Only once you understand the importance of these two ingredients and started implementing them within your work will you start to take sincere and honest portrait photographs.An open and relaxed subject will do all the work for you, they will have their life story written all over their face. But in order to see it, you have to reveal it, and in order to reveal it you have to care about the time they have gifted to you. Building a relationship is the key to achieving this. You have to be absolutely clear in your mind prior to the shoot exactly how you want your final image/images to look. In fact, do you ever ask you self the question Why am I taking this image? This is important in order for you to ensure that you are working within a workflow that helps tell the story you are wanting to tell. For example, there is no point in writing a piece of work about the ageing faces of sport climbers if all your accompanying portrait photos are of trad climbers, cleverly lit to reduce the appearance of age. Knowing exactly what story you are wanting to tell and why you are wanting to tell it will create a much more fluid workflow. Your subject will feel at ease as it will be evident to them that you are wanting to tell a story about who they are and simply not execute a soulless shoot. Unless of course you are just wanting to create instagram content or are shooting for a Jackamo Catalogue. It’s the story contained within an image that in my opinion has more clout than the technical proficiently. Technical competency can be easily taught and learnt. Understanding why you are wanting to take an image is a little more illusive. Without clarity there is no trust, and without trust there will never be clarity. A paradox that took me longer than I would have liked to figure out! This point does relate back to my initial insight The Relationship. When you are telling an individuals story through the medium of photography you have to make your intentions known to the subject from the start. In no way must you have alternative motives or hidden agendas. With clarity comes the trust and with this trust comes and honest story. Clarity in what you are wanting to do, how you are wanting to do it and why you are doing it should be evident to all involved from the very first contact with your subject. I always ask my self the question, am I being clear with myself here? And only when a clear answer comes back will I start the process of engagement. People often are always looking but very few people have learnt to see! By seeing its possible to capture what I often call the moments in between. What I mean here is the small quirks we have with our facial expressions - it’s what contributes to the expressions of our personality. Being able to see these moments in-between and recognising them will help you peer into a persons deeper sense of self. Its during these moments that we see a persons true personality; often witnessing things that only their closest allies will get the privilege of seeing. But without seeing you wont notice any of this, and you will focus on the global expressions. I find that the best was to revel these moments in between is to initially engage with your subject without the camera in sight. This is especially useful if you have identified a subject that is particularly nervous. I recently had the privilege of loaning one of Benro's Mach 3 tripods courtesy of the guys at Benro and Dale Photographic Leeds. After four years of heavy abuse, I had managed to disintegrate my old Benro, one to to many bumps and bangs in the Scottish mountains and the climbing crags of Yorkshire. I will be breaking this review down in to four main points. They will be, features specifications, usability, price and of course, aesthetics; lets face it, it does matter. Now I know everyone's needs within a tripod are different, after all we don't all shoot landscapes and climbers. So like the tripod, this review is aimed at people who are in the market for somthing aimed primarily at photography (stills) and mainly, studio work or landscape work. With that in mind, lets get in to it.
" As part of our most advanced range of photo tripods, the Mach3 TMA38C combines classic design with advanced materials. High performance twist locks and magnesium castings make this 9X carbon fiber tripod ideal for indoor or outdoor photo shoots "
Upon first impressions, I agree with the above statement. This is a classically designed tripod that does what you expect it to do. No fancy push buttons or cleverly over engineered features to go wrong and ultimately fail you whilst you are out on a job, an important thing to consider especially if you are working professional like myself. As I mentioned above, this is a classically designed tripod, no gimmicks and no elaborate mechanisms like some other manufacturers have started producing. It has three legs, obviously, compromised of 4 sections per leg with each section being joined with a magnesium cast twist lock mechanism. The particular model is made from carbon fibre and magnesium mouldings, the result is a very solid and light tripod for its size, this particular version does reach a maximum height of 156.5cm at its 24 degree setting. The MACH 3 legs are able to spread out to an additional two positions allowing you to work close to the ground. Combined with the short column, which comes with the tripod as standard, you can achieve a minimum working height of 33.5cm. Each of the legs are made from a 9x layer of carbon fibre. My understanding is this strikes a perfect balance between strength and weight. I must admit, for two months I put this tripod through its paces and and at no point did the build quality concern me and neither did the weight. So they have certainly got something right here, sweet! The twist locks are made from a strong and light magnesium casting, again helping reduce the weight but without compromising on the strength. The twist locks are wrapped in rubber which is superbly grippy even when wet and with super comfy ergonomics, they really are easy to use and intuitive. With spiked feet, short column, carbon fibre legs and a cary bag all included, there really is very little you could realistically need or desire from a tripod primarily aimed at the outdoor stills photographer. There really is no need to rattle on about the usability of this tripod, it simply is, simple to use. It just works and it is as simple as that. The rubber grips in the twist locks allow for a great sense of feel and security when locking and unlocking the legs, even when wearing gloves. Then there is the actual twist locks themselves, they only need a quarter turn and your are in action, the legs slide out and stop with a reassuring knock. You simply just repeat the quarter turn the other way and the legs will slide back into there respective place just as easily. The centre column lifts easily out and the lovely anodised blue collar allows you to adjust the amount of friction when you are trying to compose with out having to tighten it fully all the time, a nice touch I thought. This is a relatively large tripod with a maximum working height of 156cm, but yet the weight was not an issue. It was very easy to attach to my F.Stop Ajna and the large foam grip one of thee legs made it super comfy to carry around in your hand too. It's worth noting that the legs do not fold back on them selves with this particular model. To be honest it was not something I missed and it certainly did not detract from its ability to be transported easily. With the legs fully extended to its maximum working height the tripod is very stable, even in a relatively strong wind, something you tend not to find the some of other equivalent brands. The centre column is very easy to remove so you can replace it with the shorter column to make full use of the leg adjustability when working close to the ground. I said it above, but this tripod really is simple to use. The usability is great and at no point did it fail me. For the working professionals who know me, they will tell you that aesthetics and data really mean much to me. If my gear works the way I want it to with no surprises then as far as I am concerned its perfect. How ever, If I am honest with you, this range of tripods is stunning. The anodised blue accents contrast really well against the smokey grey carbon on the legs, it really was a pleasing thing to look at and work with. The top leg section has a blue anodised collar which you can only see when the twist lock is undone, a really nice and useful touch which I found really helpful, especially when trying to figure out which leg may need tightening. Overall a really nice thing to look at when working with it. Now this is the clincher in most cases, your budget. If we compare this to some of the other equivalent brands, we can see that Benro have done a fantastic job at giving you allot of bang for your buck! I have listed below some of the more mainstream rivals including there prices, each model is roughly equivalent in spec and features. Now where does the Benro Mach 3 TMA38C fit into all of this ? As you can see from above, the Benro is the cheapest of the three competitor brands. If your like me, the immediate question or concern would be that it must lack something. The build quality must not be on a par or something similar ? Well compared to the Manfrotto, the Benro wins hands down every time. My 10 year old Velbron has a better build quality than Manfrotto these days. Compared to the Induro, honestly, they are made in the same factory and are almost identical in every single way. The Gitzo, which is a great tripod is heavier weighing in at 2.61kg, almost a full 1kg more than the Benro. So the real question should be, why are the other 3 so much more expensive? Well in my opinion there is no reason. It seems that in a word of ever increasing prices, they have simply jumped on the price hike band wagon. If you want an expensive, poorly made tripod, by the Manfrotto, or if you wish to spend another £235 on the Induro for what is essentially a Benro, go ahead. Or alternatively you can spend even more on the Gitzo, and carry more weight, at least you will be able to feel the weight of all those extra pounds you have spent. The Benro Mach 3 is a great tripod that works. Its light, sturdy and superbly well made. Ergonomically well thought out and quite nice to look at too. You might be thinking I am obliged to say nice things, well I am not. I am in no way affiliated with Benro, although if your looking drop me an email ;), and yes Dale Photographic do essentially keep me in business but I am under no obligation to be nice. I have now in fact parted ways with the loan tripod and forked out the £299 quid and put my money where my mouth is - you cant get any more honest than that really. Are we loosing our identity as rock climbers? Our dirtbag charter, being diluted amongst the Canada Goose down jackets and immaculate Patagonia baseball caps. In the last couple of years climbing has boomed, we have seen numerous new indoor walls opening within our city boundaries, no longer confined to the outer edges of the city limits. In fact, the BMC has reported that their is now something in the region of five million climbing wall users and some 350 plus indoor walls listed in the BMC wall directory, all surely set to rise with the successful addition of indoor bouldering to the 2020 Olympics? Don't misunderstand me, this is not overtly bad. I know I for one have benefited greatly from the boom of new in-door walls that are opening; I only have to walk 500 meters to my local wall now as opposed to a 30 minute drive previously. The boom has also attracted new brands into the sport such as Adidas, BMW and many others capitalising on the huge profits that are currently being generated. It goes without saying, climbing walls have transformed the face of climbing - no pun intended. However, the rise in popularity is also having its negative impacts, this has been more harshly felt by the, dare I say it, genuine climbing community. Concerns with ethics, environment, relationships with land owners and such like have all been big news of late. The destruction of Whitehouses is a prime example, as well as the tensions that are currently ongoing at Almscliffe with the land owner where we have lost access to evening bouldering what’s next to come? A complete ban? It is with this in mind, I started reminiscing on the humbling tribute to Ken Willson which Hot Aches Productions put together prior to his departure of our world. Ken Talks about climbing in the 60s and 70s, when, climbing was very much a subculture of his time. led by the zeitgeist of the the post war mind set. This is a period in our climbing history were the ethics and unwritten rules of our sport were laid down, hard routes were climbed, in more often than not the purest of ways. This laid down the foundations for the next generation of hard climbers, which included the likes of Ben Moon, Johny Dawes, John Dunn and Steve Dunning just to name a few and so the next series of hard climbs established and standard was risen again. On the surface, its seems that the generation following these pioneers is non existent, or at least the unground subculture that Ken Wilson talks about. But if you scratch below the surface, you will find a thriving resurgence, a relative small band of people staying true to the unwritten rules that are engrained within the climbing community psyche and still pushing the sport forward. This past winter season has seen some incredible repeats, and some super new lines being established. However, I was curious to find out if my own radar was on point or am I simply way off the mark. Its with this observation in mind, I caught up with some well known climbers currently to ask them to reflect on this past season and what they they think has changed over the last decade and what impact if any, is the rise in popularity of climbing having on the larger community? I think the current UK climbing scene is great. It feels to me like it has changed a lot in the past 10 years, diversified and grown tremendously. One of the wonderful things is seeing far more women engaged in climbing. When I was growing up I was very often the only woman in a group of male climbers, that is less often the case now, which is lovely. The sport has also separated in some ways, with competition climbing becoming a very different endeavour, almost a different sport! The attention that competition climbing gets has without doubt caused a spike in popularity but this has mainly reached the indoor walls and it will be interesting to see if and how much this will impact the outdoor crags. There is a lot to consider for climbing moving forwards in terms of conservation and protection of our crags, the wildlife we share them with and the access that we often take for granted. 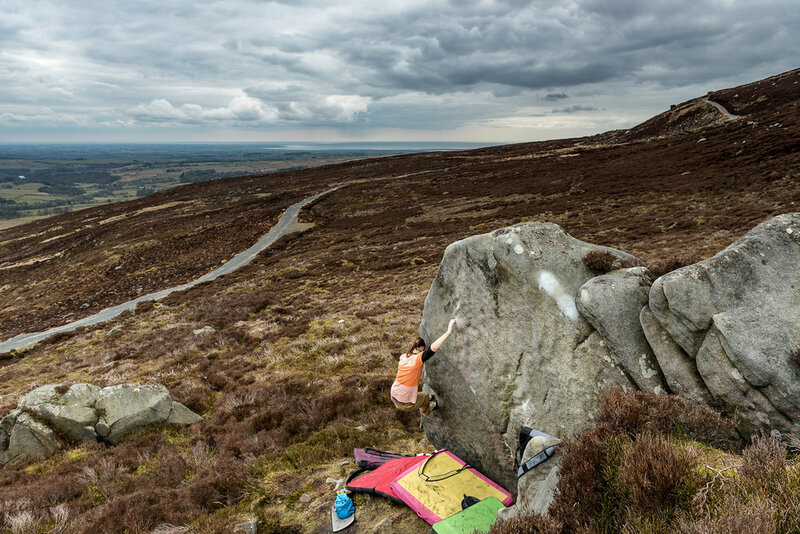 “Is it me or is there a definite bouldering renaissance happening here in God’s own country? Now, don’t get me wrong, Yorkshire has always been the home of cutting edge bouldering pioneered by some of the best in the game, it’s just the pace that is so inspiring at the moment. There doesn’t seem to be a week that goes by without something significant happening. Rhythm, Cypher and High Fidelity have seen multiple ascents of late. Highball horrors that were once walked past are becoming something of trade routes. Tender homecomings saw about half a dozen ascents one Saturday last November having probably not had that many since it was put up by Nick Dixon back in the 80’s. Add to that the new route development and seeing some truly stellar lines being put up…James Turnball’s The Gift, Tom Newman’s Panic Attack and Oliver Parkinsons’ Gun Shy spring to mind. Behind all this amazing activity is a “scene” that is vibrant, supportive and encouraging community which leads so many of the regional classics seeing regular attention (Ben’s Groove sit, Zoo York,Curious Yellow, Chiasmata, Sole Fusion, Vicious Streak, Brownian Motion act etc) and once unfashionable crags like Rolling Gate, Ash Head and Guisecliffe seeing the interest they deserve. Without a doubt social media is a factor in all of this excitement; cool vlogs, inspiring Instagram profiles, online topos and creative youtube / vimeo productions all help to raise the profile of what is unjustly thought of as the little brother to the big brother of the Peak District. “Winters in the UK are tough, it's often hard to get good consistent conditions, and this winter was no exception. We had some pretty weird weather going on with back to back snow storms. I was pretty stoked to see so many people travelling and making the most of it though. Yorkshire seemed the place to be, and it was exciting to see some of the hard test pieces being done, and in good style! I recently did at lecture at Leeds Beckett University about my workflow and how I go about engaging my subjects when it comes to my chosen medium of story telling through my photography and this got me thinking about all the various elements that go in to composing a piece of work. I figured I would share some of the things I find important when working on a project with the rest of you, hopefully giving you an insight into the methods I use within my work. For fear of turning this into a lecture, I have condensed this down into what I feel are the key points to consider. For me this is the most important part of any creative profession, in fact I could write an entire book on the importance of this point. All too often I see and read pieces of work where it is evident that the creator has not taken the time to understand and become captivated by their chosen subject, whether this be a landscape/portrait shoot or a piece of writing/interview, the lack of engagement is made evident through apprehension with interview questions and their accompanying answers or photos that seem forced resulting in an uneasy experience for the viewer/reader. This point is even more important when we are talking about a piece of work that involves portrait photography accompanied by an interview or story; this is where being able to engage fully with your subject will make a piece of work more intimate, honest and original. To achieve this you have to build trust and have a genuine interest in what you're trying to portray - you have to spend a lot of time imagining what it might be like to walk a few miles in the shoes if your subject. In doing so you may find yourself becoming consumed and obsessed with the project; I often feel that I become a little like the person I am writing about or photographing, I don't intentionally do this, it seems to be something that happens to me but I am on some level aware of it - I always seem to take a little bit of that person away with me. Building trust and sharing your ideas with your subject will help instil confidence in your abilities, it tells your subject that you have thought about this, you understand your craft and what you're trying to convey and, above all else it tells them you understand what they are about. That's right, if your aim is to contextualise your climber within their environment you are essentially taking landscape pictures but the climber is generally going to be your focal point. With this in mind you want a lens that is able to rendition colours beautifully, is sharp and suffers from very little to no lens flare. Generally all the same qualities you would be looking for in a dedicated landscape lens. However, climbing photography is also portrait photography and this means you have to consider how the ambient light, or artificial light if you are using one, will impact your overall composition. With these two elements in mind you have to think about not only the lighting on the landscape but also ensuring your focal point, the climber, is well lit. Considering lighting ratios and the softness of the shadows are important factors, get these wrong and you will either end up with a well exposed landscape photo and an underexposed climber, the opposite of this or something that is just simply way to contrasty. Check out the image below to see how I balanced the exposure of the climber and the landscape. I'll keep this short because there is no need for it to be anything other in my opinion. There is no right or wrong answer here. The lens you use will be determined by simple factors such as, what works best for the composition, what is most practical for the situation you're shooting in and which one you think will yield the best results for the project. For eighty percent of my work I use two lenses: a 24-70 and 70-200. For the remainder of my work I use an 18mm and an 85mm. These focal lengths have all been purchased with a specific use in mind, and I tend not to deviate from this. My two zoom lenses are my go-to pieces of kit for any climbing photography, they are auto focus, they have great range, they are lite and I know exactly what results they will yield. In a climbing situation when suspended from a rope or out in the mountains in winter, you need the flexibility these types of lenses offer, allowing you to focus more on the light and composition. My only other two lenses are manual focus, and these are used for landscape or portrait photography, again bought with the this application in mind because it works best for the style of photography I like produce. Working with manual lenses allows you to slow things down - take a moment to give the composition the time it deserves before hitting the shutter cable. So in essence, the above choices are purely subjective, work with what you enjoy and what feels right for your work. This is the rule for all aspects of photography as I am sure you are aware, it is essentially the fundamental foundations of any visual art. When considering how to compose the shot, I like to spend some time looking at the climbing line and establishing where the crux move is or the most interesting body position will be. The beauty of using a wide angle lens here is you can get in close to your subject but still allow the background to fall away with deep depth of field which in turn helps to provide some context to the environment in which you are photographing, I find my 24-70mm works best for this. Once you have figured out the move you want to capture, walk around and look for interest within the landscape, the tricky bit here is trying to compose all the elements in one shot and align them in an intelligent and intended way. Again this comes down to personal choice, when shooting with a wide angle lens try avoid shooting at eye level as this can leave the viewer with an image that looks similar to that of everyday life. I personally like to shoot around two feet off the floor, this gives quite an immersive feel to the image and can give the audience a different angle of view from what they are used to seeing most days whilst walking around. This method generally only applies to work where rope access is not needed, for example bouldering or some sport climbing lines. When working above your subject and using telephoto lenses, all of the above apply, except there are additional things to consider such as, are my ropes set up correctly so I don't die! There is one thing I like to showcase when working from above a climber, and that is the emotion or the movement of a climbing sequence. I treat these compositions very much the same way I treat my portrait photography; I want to draw my viewer to the climber's eyes or facial expression and this is where the game of light is crucial. An example of drawing your viewer to a specific point of interest, this method of lighting can also be applied to a climbing situation, as the below picture demonstrates. Although this is a climbing composition, the lighting was planned for a portrait shoot, Intentional split lighting to draw the view across certain parts of the image.